It has been an exciting journey since we released the first version of Appogee Leave in 2011 and we are thrilled about the work we have planned for the future. Based on feedback received from our customers we have been hard at work to improve Appogee Leave for an ever better experience, regardless of what your role is. As we reach our second anniversary, we are pleased to announce Appogee Leave v6 which will be rolling out before the end of July. Relabelling the user settings in the top right menu to preferences. Taking the personalised company logo and moved it to the top right of the screen to give it more prominence and consequently the Appogee Leave logo has moved from top right to bottom right. And, as can be seen in the screen above, we’ve added the ability to customize the main colours used in the application, so if you don’t like our default orange look it can now be changed. We’ve revised the top level menu choices (which display only options available to the signed-in user) to separate out the HR Admin and system Configuration features, and we’ve now enabled the initial setup of the application to be delegated to another user. We’ve added a new dashboard for managers which brings together outstanding requests with the information likely to help them assess whether to approve them. We think this page will prove to be the most used page for managers, so we’ve added in the ability to flag this (or indeed any page in the site) as your personal start page. 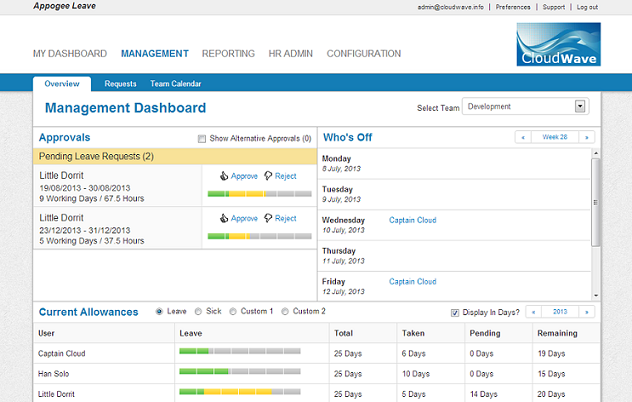 We are introducing a new top level menu for Reports. Not only will this make it easier to access reports which have previously existed in the system, but we’re also exposing reports to managers for the teams they have permission to access. Expect to see more enhancements in this area later in the year. 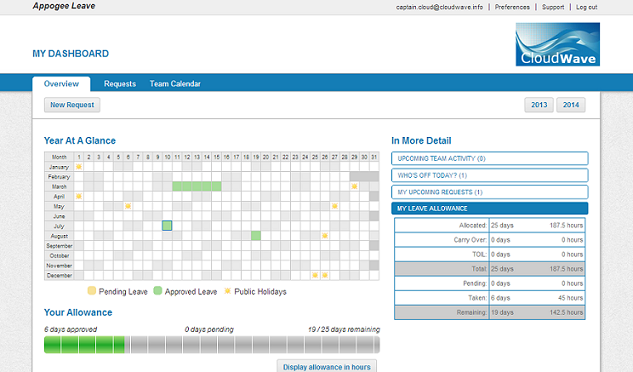 As always we’ve added in smaller improvements based on user requests, so Team Calendars now include the ability to toggle the display of week numbers, public holidays and non-working days. We think this represents exciting progress for Appogee Leave, and we hope you do too. And there’s more to come later in the year! We’re happy to receive your feedback, so please leave a comment below, add your feature requests or give Appogee Leave a customer review.